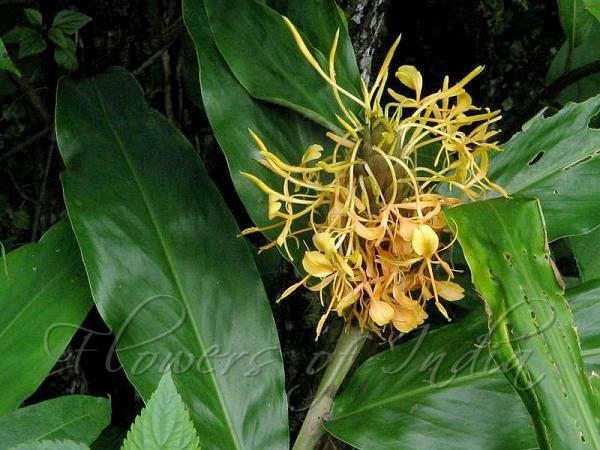 Yellow Butterfly Ginger is a perennial rhizome forming herb. Leafy shoots are 1-1.5 m tall, slanting. Leaves are 15-22, stalkless, 5.7-10.0 cm apart, spreading. Leaves are 24.2-30.6 x 6.0-6.5 cm, elliptic-inverted-lanceshaped, dark green and smooth above, pale green (pale pink tinged towards base on lower leaves) and silky below. Margin is translucent, pale pink tinged; tip twisted, long-pointed, base blunt. Inflorescence is 6.5-10.0 cm long, elliptic, dense. Bracts are 3.9 x 1.6 cm, spoon-shaped, boat-shaped, green with red tinge. Cincinnus are 2-4 -flowered. Bracteoles about 1.6 x 1.0 cm, white with red tinge. Flowers are 9.8-10.2 cm long, lemon-yellow, turning to a much darker shade on the second day, spreading. About 4-8 flowers are open at a time. Sepal tube is 3.4-3.5 cm long, about 2.5 mm wide at mouth, pale greenish-yellow with red tinge. Flower-tube is 6.5-6.6 cm long, about 3 mm wide at mouth, lemon-yellow, whitish towards base, slightly arching, smooth externally, hairy internally along the margin of filament groove, hairs downwardly directed. Petals are lemon-yellow, membranous, drooping from flower, hairless, margin rolled inside, slightly coiled like an expanded spring. Dorsal petals is 3.5-3.6 cm long, about 0.4 cm wide, 1.5-2.0 mm long beaked at tip. Lateral petals are 3.1-3.3 x 0.4 cm, non-beaked at tip. Lip is 2.6-2.7 x 1.7 cm, obovate, lemon-yellow, upper half reflexed back spreading on flower, gradually clawed at base; claw about 5 mm wide; sinus 8-9 mm deep; lobes obtuse at tip; outer margin undulate. Stamens are 3.7-3.8 cm long, filament 2.6-2.7 cm long, about 1.5 mm wide at base, lemon-yellow, slightly arching; anthers about 1.2 x 0.3 cm, oblong, lemon-yellow, oblong, lobes parallel. 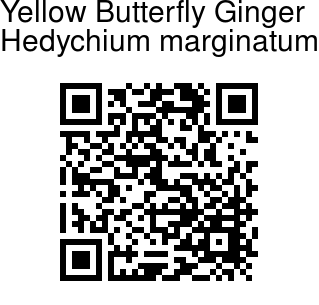 Yellow Butterfly Ginger is native to NE India. Medicinal uses: Decoction of rhizomes is given in bronchitis and stomach complaints.